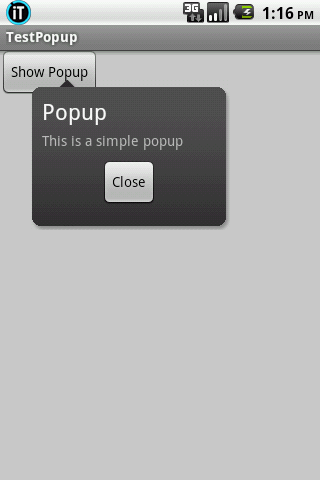 In this post I’ll show you how to create a popup window in Android. A popup window can be used to display an arbitrary view, and it can be very convenient in cases when you want to display an additional information, but don’t want or it’s not appropriate to launch a new activity or display a dialog. Put the image into res/drawable directory. nice tutorial! can you please do a tutorial on sd card, how to work with sd card in AVD, how to read and write file etc thanks! Nice tutorial, I just picked up a new Android device so I want to try this out. Wow, great post! I always wondered how Evernote created pop-ups…. Keep it up! Hello! Your blog is great. I’m a total beginner in web design, but hope that one day I’ll also write apps for android. If you have any ideas what I should start with, please write it on my blog. hello.. i have done to add multiple poppup,.. but i have stack on listview, can you help me? how to add listview inside popup… thanks..
nice tutorial Andy , this popup dialog has sooo many uses!! Yep, I agree with you in regards to using DIP instead of Px. Thanx a bunch..this helped a lot to make a custom menu..
Thanx …it help me lot..
hi! have u tried this already using GridView? when an item is clicked the popup will be displayed. your reply will be a great help for me tnx. There isn’t any difference showing the pop-up when a button is clicked, or when an item from GridView is clicked. Just call showPopup() in onItemClicked and it should work. hai i when i switched from portrait mode to landscape mode pop up view is disappeared i want retain that popup. please tell me what i need to implement? Any controls you want to access from the Popup should be accessed through a reference to the layout of the pop-up. Thanks. I found this needed some tweaking of margins, and some density-independence calculations to look right. Here’s a way to set the popup size in a general way at the start of showPopup(). when i click on show popup ….nothing happens !! why!!!! the same code i din’t know why!! Many amany thanks! Its realy helpful to me. Helpful post. Thanks for that. let’s keep the presented case: i need the popup to block all the content from the activity( same way as a dialog box, with background color), except the show popup button. Basically the popup should have the picture as background but also a background color and fill everything starting below the show popup button. Please if you have any ideas on how i could implement this i would appreciate. I had to rename the 9 patch file after downloading (I assume that is an HTTP server configuration issue) and create the drawable directory, but after that, the project built w/o error. But when I run, I see no text on the Close button, the text, foreground and background of the popup are all out of alignment. Not to mention: the text is very hard to see against the popup background, since they are both shades of grey. On the emulator, (emulating a Nexus 7 but with 8″ screen), I cannot see the difference at all. On the Nook Color HD, I can see the difference, but as I mentioned, everything it out of alignment. Is this sample code making assumptions about screen size/density or about text size? Thanks a lot for the great, easy to follow tutorial ! How would you suggest making the size of popup more dynamic ? Maybe doing something like : “Fixed Height with Dynamic width” ? How to align the popup to the top of a button and not bottom right since my button is in bottom right corner? thank you. this is very useful to me. Is there something dangeriously wrong with this class? if you put give 5 stars. Good tutorial for android popup windows example! Thanks for post! Thanks for this man! I just implemented it in my app and it works great. I’m a beginner and will use this to further my knowledge of how the class relations work. Reblogged this on Rv Panchal. this is useless becouse findViewById returns null. R.id.popup doesn’t exists in context so result is null. R.id.popup is the ID of the LinearLayout declared in layout/popup_layout.xml. Check if you did not missed that. He also need to check that the R file is getting built. That often fails in Eclipse, I often have to force it by editing an XML file. Hi thanks for the tutorial. I was wondering how to generate a popup to trigger when i open an application like whatsapp. I’ve been told I don’t read full messages often and I haven’t found an app that would force me to do it. hence thinking of making something of my own. Looking at your blog i will need to build the layout of the popup and most likely tweak the popup activity itself. I’m thinking what i’m wanting would be active all the time and just wait for me to click “whatsapp” to display the pop up. I hope you can guide me. haven’t seen any guides to do this so far.